This is a go-to meal for me. 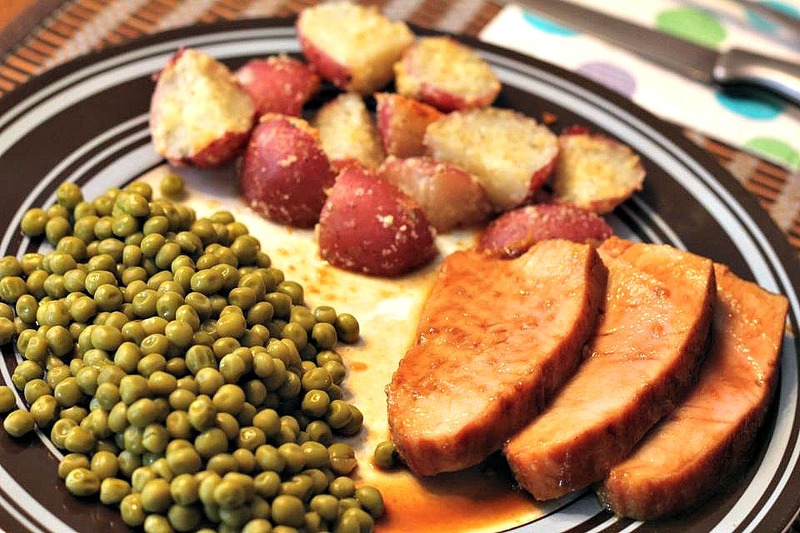 I love pork tenderloin, and this is one of my favorite ways to prepare it. It’s so tender and juicy with just a touch of sweetness. It does take some planning ahead since you have to marinate the pork for several hours, but then once you’re ready to cook, all you have to do is pop it in the oven. I’ll go ahead and give you fair warning…when you’re mixing up the glaze, it will probably smell AWFUL. The first time I made it, I was holding my nose and thinking “oh great, this was a waste of money” because it smelled like it was going to taste terrible. However, since I’ve made this dish about 4 times since then, it’s safe to say it was not a waste. Maybe you won’t think it smells too bad, but if you do, have no fear! I promise it will still be delicious. The potatoes you see in the background are Roasted Parmesan Potatoes, and they were so good! Blake and I love potatoes, and I’m always trying to find new ways to serve them. So today, you’re gonna get a 2-for-1 special because I’ll be sharing both recipes. Combine first 4 ingredients. Brush half of mixture over pork. Cover and chill 8 hours. Chill remaining glaze. Bake @350 for 45 mins. Turn once during cooking and baste with reserved glaze. Preheat oven to 350 degrees. Boil a large pot of water and boil the potatoes for 4-5 minutes. Remove from water and let cool. Once cooled, slice into quarters and combine with olive oil, garlic powder, sea salt and black pepper as well as the Parmesan. Mix thoroughly and place in a baking dish that has been sprayed with cooking spray. Place into the oven and roast for 20-25 minutes. Remove from the oven and taste, re-season with sea salt, cracked pepper, or garlic powder if needed. Garnish with parsley. Made this tonight and it was a big hit with the fam! Very tasty! I was surprised at how good the molasses sauce was. Neither the molasses nor the mustard was overbearing. I also had a cheesy squash casserole ( because you can never have too much cheese) and I had a craving for some good ole summer squash! Yay I’m glad y’all liked it! Thanks so much for reading/commenting It makes me feel good to know that other people are actually trying these recipes!